Colombia’s Justice and Peace Law (JPL) lies at the heart of the country’s efforts to dismantle notorious paramilitary groups and provide justice to thousands of their victims. The law was negotiated in 2005 as part of the demobilization process, offering former paramilitaries reduced prison sentences in exchange for their full confession and "contribution to achieving national peace, collaboration with the justice system, reparation for the victims, and adequate re-socialization." As Colombia’s government seeks to reform the JPL to allow for a more effective process, ICTJ will run a series of features to provide a deeper insight into the background and successes and challenges of the law. 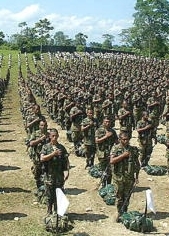 Colombia is implementing transitional justice measures during an incredibly complex conflict with numerous mobilized actors: the army, right-wing paramilitary groups, the leftist Fuerzas Armadas Revolucionarias de Colombia (FARC) guerillas, and other rebel factions. The violence also stems from a wide range of causes, including natural resource and land struggles, organized crime, and drug trafficking. It is estimated that the victims of the violence number more than four million; Colombia is home to the world’s second largest population of internally displaced people in the world, living in extreme poverty. Colombia’s vibrant civil society actively advocates for the rights to truth, justice, and reparations for victims and the country has developed a legal framework for the protection of human rights. However, despite a strong legal tradition, a wide gap endures between the laws on paper and the protection of rights in practice. "The outcomes should include the truth about the actions of the political and financial sponsors of paramilitaries." The declared premise of the JPL is to strike a balance between effective demobilization and the need to guarantee victims’ rights to redress. Despite some obvious gains resulting from paramilitaries’ confessions, including a record identifying some 400,000 victims by name, it is clear that the process needs to be reformed if public confidence in the process is to be restored and accountability achieved for perpetrators and their sponsors. Today, more than 2,000 demobilized paramilitaries are still awaiting trial, and only seven cases have ever reached a verdict. A conference will be held in Bogotá on May 14, where the reform of the JPL will be discussed among government representatives, civil society activists and international experts. In the lead up to this event, ICTJ will publish features and background documents on the Justice and Peace process, as well as an interview with our vice president Paul Seils on possible strategies for the selection and prioritization of criminal cases. The event itself, organized by ICTJ and the Organization of American States, will be streamed live from Bogotá on our Spanish website. We hope this series of features will contribute to a better understanding of a process central to Colombia’s effort to embrace transitional justice as a way of addressing the legacy of its conflict and creating a society committed to protecting human rights. Please send us your feedback on the series, along with suggestions of other ongoing transitional justice processes you believe should be presented in depth on our homepage to communications@ictj.org.